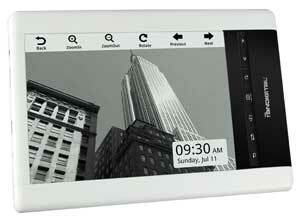 Pandigital is launching an ePaper version of its Novel eReader this month with touchscreen capabilities. 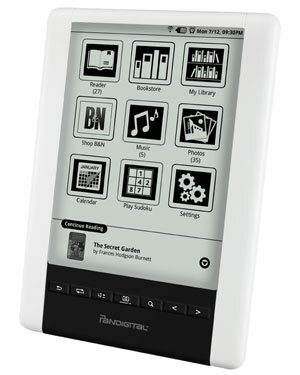 Called the Pandigital Novel Personal eReader, the ePaper version will provide access to the Barnes & Noble eBookstore along with a number of other convenience applications. The Novel Personal eReader's 6-inch ePaper display resolution of 600x800 matches that of other eReaders, such as the Amazon DX or the Sony Reader Touch Edition, and provides 16 level of grayscale. 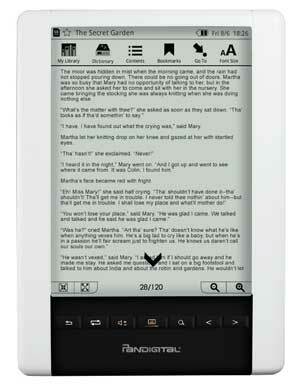 Unlike the Kindle, the Novel Personal eReader has a touchscreen that can be used while reading or for the other built-in apps. And the display is non-reflective, making it ideal for reading in bright indoor lighting and sunlight. When in reading mode, the Pandigital Novel Personal eReader offers the standard convenience features: adjustable font size, a built-in dictionary, word/character search, highlighting and creation of multiple bookmarks. All of which can be controlled using the touchscreen. In addition to its eReader functionality, the Novel Personal eReader's integrated apps let you browse the web, check email, play games, view photos or listen to music. Access to books, the web and email is accomplished through the built-in Wi-Fi connectivity. A 3G version is not offered. The Novel Personal eReader's 2GB of internal memory is less than the 4GB of the Kindle DX, but should be plenty for most owners. If not, the Novel offers a microSD slot with support for cards up to 32GB and that should be enough for anyone! The new Pandigital Novel Personal eReader (model PRD06E20WWH8) will be available this month at national retailers with an MSRP $199.99. Our expectation based on previous Pandigital Novel releases is that actual street price will be considerably lower shortly after launch. * Overall not well-enough “polished” for me to use as-is. *The browser is hardly readable, so don’t get excited about that app. * The screen response is a bit erratic, and it does not respond to a stylus, but only finger tips - strikes me as worst of both resistive and capacitive types. I had a heck of a time getting my WEP key entered as it would suddenly repeat some of the virtual key taps, and of course it masks the entered characters about 1 second after entry. I do not recall seeing a calibration utility. * My Sony Touch PRS-600 is a nicer overall version of this as the dimensions and screen are almost identical. That is in terms of reading, music, and interface. Of course the Sony does not have the wifi/Internet access, but this is nothing exciting in that regard.